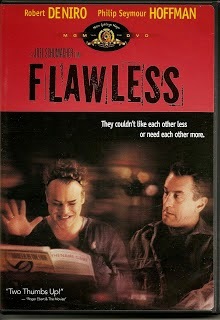 In "Flawless" Robert DeNiro is out of character as a former cop who lives alone and works as a security guard. He is a bitter and homophobic man. He lives in a flophouse hotel inhabited by whores, transsexuals and drag queens. Phillip Seymour Hoffman plays the Drag Queen. He is also Robert DeNiros' worst nightmare. You might even say they hate one another. Initially unaccepting of his physical state,he tries to shut out the entire world in a bath of self pity. But his needs, as well as those of Phillip Seymour Hoffman,will not allow it. Through singing lessons by Hoffman to help him regain his speech, DeNiro's character forms an unlikely bond with Hoffman that is tempered by the fallout from both his own stroke as well as the drug rip off which has deeply affected his neighbor, whose friend was killed. As DeNiro's character struggles through recovery he learns about himself as well as the people he always thought of as friends. His relationship with a woman dance partner also leads DeNiro to discover that love is not what it always seems to be on the surface, and that true love comes in many forms. This film has a great supporting cast and fantastic direction. The plot is fast and the movie has deep meaning concerning what we each owe one another as fellow human beings; respect.